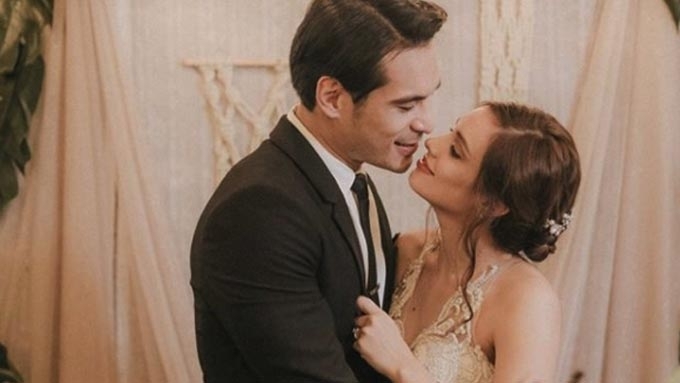 Max Collins and Pancho Magno are now married. The Christian wedding of Max Collins and Pancho Magno was high on emotions especially during the couple's vows. Friends and family of the bride and groom gathered to witness their union earlier today, December 11, at the Manila Marriott Hotel. Pancho was already crying when Max walked down the aisle in her custom Francis Libiran bridal gown. In an Instagram video posted by fellow Kapuso star and Max's bridesmaid Rochelle Pangilinan, Pancho could be seen wiping his tears. His tears continued to fall as he declared his wedding vows. The Haplos star began, "Seeing you now, in front of me, you made me realize how God blessed me with you. "Finally marrying you… the privilege of loving you, taking care of you. "Of course, growing old with you as my wife and as the mother of my children. "And baby, you’re just too beautiful to be sad. "So, I shall make you happy." For her part, Max held back tears as she recited vows. "I promise to put God first and you second. "You have the most beautiful heart and soul, my love. "You are my light, my angel, and I promise to cherish you and give you all the love you deserve. "I’m excited to fall in love with you each and every single day, over and over again." Max and Pancho have been a couple for five years. They got engaged last May 14.